Barley, N., 1994, Smashing Pots Feats of Clayfrom Africa. British Museum Press, London. Bender, B., 1985, Emergent Tribal Formations in the American Midcontinent. American Antiquity 50(1):52-62. Bloch,M., 1986, From Blessing to Violence Histoy and Ideology in the Circumcision Ritual of theMerina of Madagascar. Cambridge University Press, Cambridge. Blockman, N., 1997, TheLodian Culture (JerichoIX) Following theExcavations atNewe Yarak, Lod. M.A. thesis, Tel Aviv University. Boas, F., 1955, Primitive Art. Dover, New York. Braidwood, r. J., and Braidwood L. S., 1960, Excavations in the Plain ofAntioch. Oriental Institute Publications. University of Chicago Press, Chicago, Illinois. Conkey, M. W., 1987, New Approaches in the Search for Meaning? A Review of Research in "Paleolithic Art." Journal of Field Archaeology 14:413-428. Criado, F., 1989, "We the post-megalithic people. . . "In The Meaning of Things, Material Culture and Symbolic Expression, edited by I. Hodder, pp. 78-89. Harper Collins Academic, London. Davis, S., forthcoming,The Animal Bones fromNahal Zehora I and IIln (ed.) A. Gopher, The Nahal Zehora Sites: Pottery Neolithic Villages in the Menashe Hills Israel. Monograph Series of the Institute of Archaeology, Tel Aviv University. Douglas, M., 1966, Purity and Danger. An Analysis of the Concepts ofPollution and Taboo. Routledge, London. Ferguson, J,, 1985, The Bovine Mystique: Power, Property and Livestock in Rural Lesotho. Man (New Series) 20(4):647-674. Galili, E., Weinstein-Evron, M., and Zohary, D., 1989, The Appearance of Olives in Submerged Neolithic Sites along the Carmel Coast. Mitekufat Haeven (2):95-97. Galili, E., and Sharvit, J., 1994-5, Evidence of Olive Oil Production from the Submerged Site at Kfar Samir, Israel. Journal of the Israel Prehistoric Society 26:122-133. Garfinkel, Y., 1992, The Material Culture in the CentralJordan Valley in the Pottery Neolithic and Early Chalcolithic Periods. Ph.D. dissertation, The Hebrew University, Jerusalem. Garfinkel, Y., 1993, The Yarmukian Culture in Israel. Paleorient 19:115-134. Garfinkel, Y., 1995, Human andAnimalFigurines ofMunhata (Israel) Cahiers du Centre de Recherche Francais de Jerusalem, Volume 8. Association Paleorient, Paris. Garstang,J,, 1935,Jericho City and Necropolis. Fifth Report. LiverpoolAnnals of Archaeology and Anthropology 22:143-168. Garstang, J,, 1935, Jericho City and Necropolis. Report for Sixth and Concluding Season. LiverpoolAnnals of Archaeology and Anthropology 22:143-168. Gimbutas, M., 1991, The Language of the Goddess. Harper, San Francisco, California. Goody, J,, 1977, The Domestication of the Savage Mind. Cambridge University Press, Cambridge. Gopher, A,, 1995, Early Pottery-Bearing Groups in Israel—The Pottery Neolithic Period. In Archaeology of Society in the Holy Land. edited by T. E. Levy, pp. 206225. Sheffield University Press, Sheffield. Gopher, A,, 1996, TheNahalQanah Cave, Monograph No. 12 of the Institute of Archaeology. Tel Aviv University, Tel Aviv. Gopher, A,, and Gophna, R., 1993, Cultures of the Eighth and Seventh Millennia BP in the Southern Levant: A Review for the 1990s. Journal of World Prehistory 7(3):297-353. Gopher,A,, and Orrelle, E., 1996,An Alternative Interpretation for the Material Imagery of the Yarmukian: A Neolithic Culture of the Sixth Millennium B.C. in the Southern Levant. Cambridge Archaeological Journal 6(2):255-279. Gopher, A,, and Tsuk, T., 1990, Earliest Gold Artifacts in the Levant. Current Anthropology. 31(4):436-443. Forum on New Materials, Florence, Italy, edited by P. V. Vincenzini, pp. 21-28. Faenza, Techna. Green, M. W.,and Nissen H.J,, 1987, Zeichenliste de Archaischen Texte aus Uruk,Ausgraven der Deutschen Forschunggsgemeinschaft in Uruk-Wark, Volume 12. Gebr. Mann Verlag, Berlin. Harrison, S., 1992, Ritual as Intellectual Property. Man 27(2):225-244. Hayden, B., 1990, Nimrods, Piscators, Pluckers and Planters: The Emergence of Food Production. Journal of Anthropological Archaeology 9(3):225-236. Hodder, I., 1984, Burials, Houses, Women and Men in the European Neolithic. In Ideology, PowerandPrehistory, edited by D. Miller and C. Tilley, pp, 51-68, Cambridge University Press, Cambridge. Hodder, i., 1990, The Domestication of Europe, Blackwell, Oxford. Kafafi, Z., 1985, First Season of Excavations atJebel Abu Thawwab (Er-Rumman), 1984 Preliminary Report. Annals ofthe Department of Antiquities ofJordan 19:31-41. Kafafi, Z., 1986, Second Season of Excavations atJebel Abu Thawwab (Er-Rumman), 1985 Preliminary Report. Annals of the Department of Antiquities ofJordan 20:57-67. Kafafi, Z., 1987, The Pottery Neolithic in Jordan in Connection with other Near Eastern Regions. In Studies in the History and Archaeology ofJordan, Volume III, edited by A. Hadidi, pp. 33-39. Routledge and Kegan Paul, London. Kafafi, Z., 1988, Jebel Abu Thawwab: A Pottery Neolithic Village in North Jordan. In The Prehistory, ofJordan, edited by A. N. Garrard and H. G. Gebel, pp. 451-471. BAR International Series 396. BAR, Oxford. Kafafi, Z., 1993, The Yarmoukians in Jordan. Paleorient 19:101-113. Kaplan, J., 1958, The Neolithic and Chalcolithic Settlement in Tel Aviv and Neighbourhood. Ph.D. dissertation, Hebrew University, Jerusalem. Kaplan, J,, 1965, Hamadiya. Revue Biblique 72:543-544. Kaplan, J,, 1969, 'Ein el Jarba,Bulletin of theAmerican Schools of OrientalResearch 194:2-39. Kaplan, J,, 1978, Habashan Street. Encyclopaedia of Archaeological Excavations in the Holy Land. The Israel Exploration Society 43:1159-1161. Kenyon, K.M., 1981, Excavations atJericho. VolumeIII: TheArchitecture and Stratigraphy of the Tell. British School of Archaeology in Jerusalem, London. Keswani, P. S., 1994 The Social Context of Animal Husbandry in Early Agricultural Societies: Ethnographic Insights and an Archaeological Example from Cyprus. Journal ofAnthro-pological Archaeology 13:255-277. Knight, C., 1991, Blood Relations. Menstruation and the Origins ofCulture. University Press, New Haven and London. Knight, C., 1994,Ritual and the Origins oflanguage. Department of Sociology, University of East London. Knight, C., Power, C., and Watts, I., 1995, The Human Symbolic Revolution: A Darwinian Account. Cambridge Archaeological Journal 5(1):75-114. Köhler-Rollefson, I., Gillespie, W., and Metzger M., 1988 The Fauna from Neolithic 'Ain Ghazal. In The Prehistory, of Jordan, edited by A N. Garrard and H. G. Gebel, pp. 423430. British Archaeological Reports International Series 396. BAR, Oxford. Kuijt, I., 1996, Negotiating Equality through Ritual: A Consideration of Late Natufian and Pre-Pottery Neolithic A Period Mortuary Practices. Journal of Anthropological Archaeology 15(4):313-336. Levi-Strauss, C., 1966, The Savage Mind. Weidenfeld and Nicolson, London. Lewis, G., 1980, Day ofShining Red. An Essay on Understanding Ritual. Cambridge University Press, Cambridge. Marshak, A,, 1991, The Roots of Civilization. Moyer Bell, New York. Miller, D., 1985, Artifacts as Categories. Cambridge University Press, Cambridge. Muheisen, M., Gebel, H. G., Hannss, C., and Neef, R., 1988, 'Ain Rahub, aNew Final Natufian and Yarmoukian Site near Irbid. In ThePrehistory ofJordan. edited by A N. Garrard and H. G. Gebel, pp. 472-502. BAR International Series No. 396. BAR, Oxford. Neveh, D., 1996, Patterns of Activity in the Pottery Neolithic Sites ofNahal Zehora II Based on Groundstone Tools and Grain Distribution. Proceedings—Forli. 8-14thSeptember, 1996. Volume 3:469-474. Orrelle, E., 1993, Nahal Zehora I and II: Fifth millennium B.C. Villages of the Wadi Raba Culture. Quantitatiue Studies on the Pottery Assemblages. M.A. thesis, Tel Aviv University. Peltenburg, E., 1994, Constructing Authority: The Vounous Enclosure Model, OpAth 20:157162. Perrot, J,, 1968, "La Prehistoire Palestinienne" Supplement au Dictionnaire de la Bible 8:286446. Letouzey et Ane, Paris. Rollefson, G., and Köhler-Rollefson, I., 1989, The Collapse of Early Neolithic Settlements in the Southern Levant. In People and Culture Change: Proceedings ofthe Second Symposium on Upper Paleolithic, Mesolithic and Neolithic Populations ofEurope and the Mediterranean Basin, edited by I. Hershkovitz, pp. 59-72. British Archaeological Reports, International Series 508, Oxford. Simmons, A,, Rollefson, G., Kafafi, Z., andMoyer, K., 1989, Test Excavations at Wadi Shu'eib, a Major Neolithic Settlement in Central Jordan. Annual ofthe Department ofAntiquities ofJordan 3527-42. Simmons, A,, Rollefson, G., Köhler-Rollefson, I., Mandel, R., and Kafafi, Z., 1988, 'Ain Ghazal: A Major Neolithic Settlement in Central Jordan. Science 240(4848):35-39. Sperber, D., 1975, Rethinking Symbolism. Cambridge University Press, Cambridge. Stekelis, M., 1950-51,A New Neolithic Industry: The Yarmukian of Palestine. IsraelExplora-tion Journal 1:1-19. 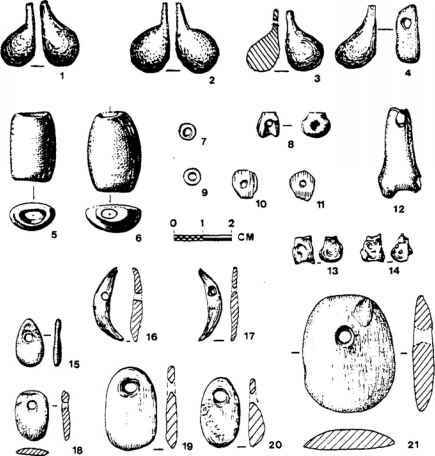 Stekelis, M., 1972, The Yarmukian Culture ofthe Neolithic Period. Magnes Press, Jerusalem. Welbourn, A., 1984, Endo Ceramics and Power Strategies. In Ideology, Power andPrehistory, edited by D. Miller and C. Tilley, pp.17-25.Cambridge University Press, Cambridge. Welbourn, A,, 1989, "Endo." In KenyanPotsandPotters, edited byJ. Barbour and S. Wandibba, pp. 59-64. Oxford University Press, Nairobi.